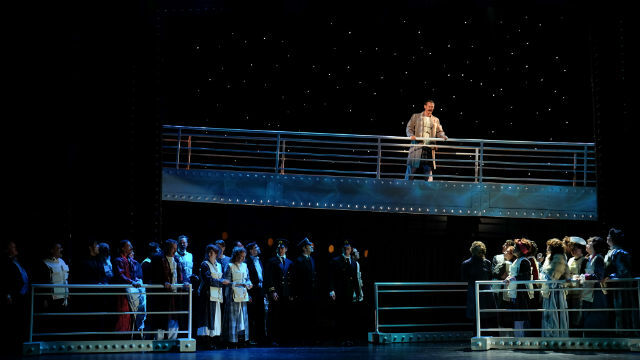 A scene from “Titanic: The Musical” at the Moonlight State in Vista. Big hopes. Big dreams. Big Ship. Big hubris. Big disaster. “Titanic” has entered the lexicon as an adjective of mammoth proportion. Its origins may be Greek (the mythological Titans were giants who once ruled the earth, subsequently overpowered by the younger Olympic gods). But since the early 20th century, the term will always call to mind that massive, doomed oceanic endeavor, the “largest moving object on earth,” touted as “unsinkable” — except that, on April 15, 1912, on its maiden voyage, it sank. That same year, a few months earlier, “Titanic: The Musical” premiered on Broadway, with book by Peter Stone and music & lyrics by Maury Yeston (“Nine” and “Phantom,” the more narratively interesting telling of that story). “Titanic” won five Tony Awards, including Best Musical, Best Score and Best Book. It is, not unexpectedly, titanic in scope, so the musical is not produced that often (or that easily), and no local company has yet attempted it. Until Moonlight Stage Productions artistic director Steve Glaudini took the plunge. The show is all about dashed dreams, at every level. The 3rd class immigrants (many from Ireland, as represented in the three adorable red-headed Kates, played by Katie Sapper, Shaina Knox and Sarah Errington) are hoping to find a better life. The 2nd class passengers (as exemplified, humorously, by Bets Malone’s gossipy social climber, Alice Beane) want to hobnob with and imitate the upper crust. And the first class travelers just want to maintain their privileged, luxury-inured status quo. Then there was the crew, from the careless, culpable Captain E. J. Smith (Norman Large) to the Marconi-loving radioman, Harold Bride (Eric Michael Parker) to the lookout, Frederick Fleet (Bryan Banville), to the hunky coal stoker, Frederick Barrett (big-voiced Richard Bermudez), most of whom just want to get back home. The British ship, part of the Olympic class of the White Star line, departed from Southampton. Of course, the story is also about striving — to be the best, the biggest, the fastest, the most technologically advanced. The conscience of the piece is the ship’s architect, Thomas Andrews (stalwart Robert J. Townsend) and his opposite is the owner, J. Bruce Ismay (mustachioed Steven Glaudini, making a rare but welcome onstage appearance). This “Ship of Dreams” is huge, and Moonlight rises to the challenge magnificently, with stellar rented sets and costumes augmented by marvelous projections, both archival and imaginatively created (Jonathan Infante). The lighting (Jean-Yves Tessier) and sound (Jim Zadai) are also excellent. Larry Raben’s expert direction and musical staging, with additional choreography by Karl Warden, keep everything and everyone moving seamlessly among the levels and decks and classes. There are a number of real stories told (why not Molly Brown’s? ), and we become endeared to or amused by a few characters or couples, with gut-wrenching moments of separation at the end. But the ship itself, and its tragedy, seems to be the major focus, and it’s a little hard to cozy up to that. The most moving duet is “Still,” between the 40-year-married Strauses (Ralph Johnson and Susan Stuber). Isidor was co-owner of Macys; Ida chose not to get on a lifeboat and to remain with him onboard). And there’s “Mr. Andrews’ Vision,” the regretful, frantic, last-minute If-Only re-thinking by the ship’s designer (Townsend). But despite soaring songs played by a robust, 26-piece orchestra, under the expert baton of Elan McMahon (who also served as musical director), the score isn’t memorable. Among the shocking facts of the disaster: there were many empty seats in the lifeboats and the exits for 3rd class were locked. Of the 2,224 passengers and crew aboard, only 711 survived. (It’s a tad creepy for all the dead to come back to life for the finale). Ironically, or perhaps intentionally, it all comes in at 2 hours and 40 minutes, exactly the time it took from the iceberg collision to the sinking. Like the gargantuan ocean liner itself, the show is a spectacle, wonderfully rendered, and a very smooth (if ultimately disturbing) sail.